Their purpose was to protect the merchants, travellers and pilgrims from robbery and provide them as well as their animals, with lodging places. Palestine had many of this type of building, because it formed an essential bridge with its traditional route (Via Maris) for trade, post and military between Egypt on the one hand and Syria/Mesopotmia on the other hand. In spite of all the aspects of the style which were found in this country, its Khans have not yet been studied although those of Syria and Anatolia have already been examined. Khan yunis lies 32 km. South of Gaza in the south west of Palestine. It is 4 km. From the sea and 45 m. above the sea level. During the sixteenth century Khan Yunis was taken to refer to the Khan itself, which was part of the system of Khans, extending along the route from Damascus to Cairo, the “Via Maris” which was one of the most important trade routes in the orient. At that time there were no dwellings close to the Khan. According to G. Schmacher who visited it in 1866, the population 700 were living in 150 cottages, bulit of bricks. In 1944 its population was 11200 by 1967 it had increased to 53,000 with 23,475 living in refuge camps. The climate of Khan Yunis is that of semi-arid region with an annual rainfall of 260mm. In spite of its climate, Khan Yunis economy depends upon its agriculture. Our historical information about the town is derived from manuscripts and the writing of the travellers who visited the area in the eighteenth and nineteenth centuries. We have no information from excavations to tell us the actual history of the town. Some scholars claim that Khan Yunis is the same spot which was named as Ienisos of Jenysos by Herodotus in the fifth century B.C. It was also named as-Silqa by al-Umari or as-Silfa by Ibn al-Furat and Khan Yunis by Maqrizi.However Khan Yunis is believed to have been established during the fourteenth century. 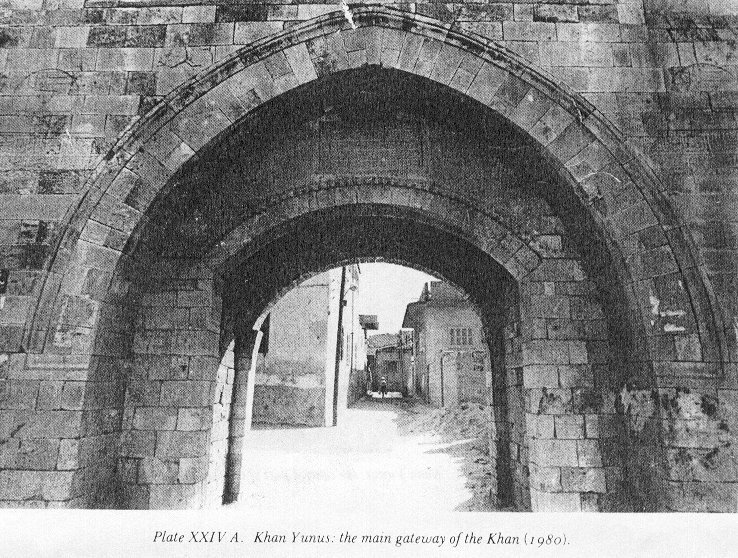 Khan Yunis was named after its builder Yunis Ibn Abdallah an-Nawruzi ad-Dawadar. He was the executive Secretary and one of the high ranking officials of Sultan Barquq, the first Cercasian Mamluk Sultan . He was called Sharaf ad-Din Dawadar, and was the brother of the prince Saif ad-Din Jarkas an-Nawruzi. He is described by historian as one of the Mamluks, the emancipated slaves, of prince Saif ad-Din Juri al-Idrisi an-Nasiri, the governor of Aleppo. He also served the great prince Yulbugha al-Umari al-khaski al-atbak. Later he became a Dawadar with great prince Saif ad-Din Isnadmir an-Nasiri al-Atbak al-Sharafi and a famous prince after him. Yunis al-Dawadar occupied different posts in Saif ad-Din Jurji’s service until he became Tablakhana and a ruler of Baalbek, before finally reaching the court of sultsn Barquq, where he became Dawadar. He was an honest prince, respected for his beneficence, famous for his generosity, open handed to poor and scholarly alike. He was also a good conversationalist. 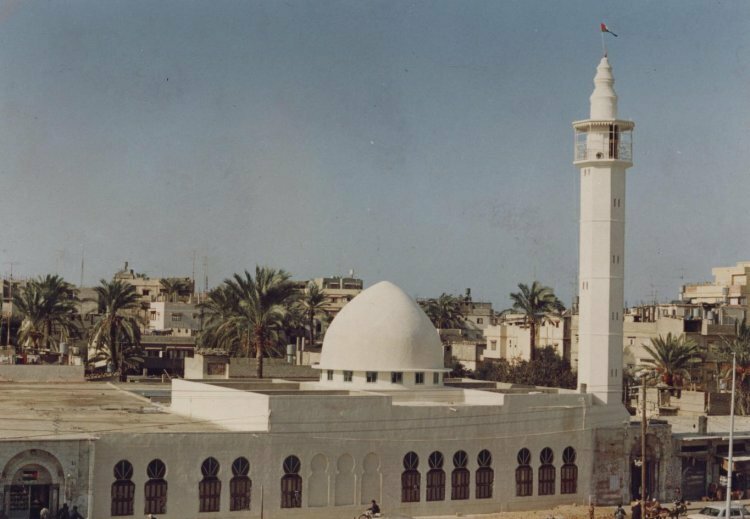 In addition to this bug caravanserai on the outskirts of Gaza, which was, according to the historians, the best caravanserai along the highway between Egypt and Aleppo. Maqrizi mentions his building in Egypt such as a Khanqa near the Qubat an-Nasr, a Kaisariyya in the quarter of the Bunduqaniyyin, and a mausoleum outside Bab al-Wazir, also, a school outside Damascus in Syria and reservoirs and public fountains in Egypt and Syria. Yunis ad-Dawadar was murdered in 791 H.A.D 1389 on the order of prince Yalbugha an-Nasiri, by the prince Anqa Ibn Shatti; with his death every one realized that as-Sultan al-Malik Az-Zahir himself was doomed. 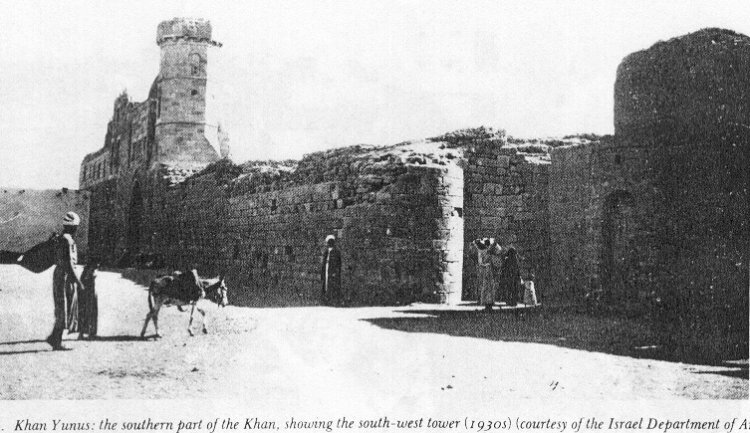 The Khan was built in 789 H.A.D. 1387 according to the inscription located on the main entrance. Its purpose was to protect the caravans, pilgrims and travelers. 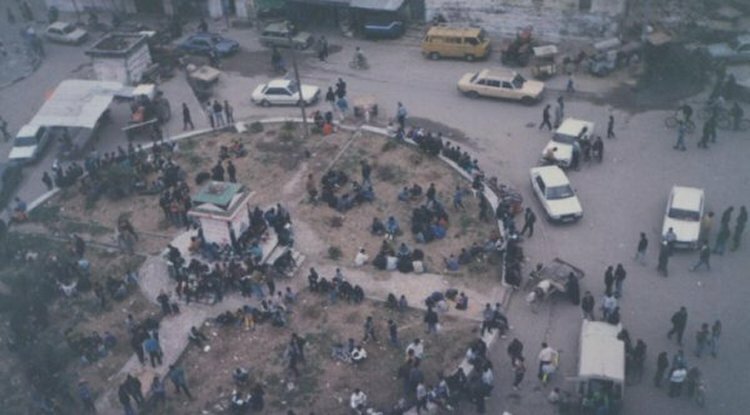 Later it became an important center for trade, the weekly market in the town was on Thursday, and used to attract traders from neighboring region. There are very few historical sources concerning the Khan. None of the travelers who visited this monument in early times made any sketches or described it in any detail, so we are not able to form a complete picture of the plan of the Khan. However, recently a 1930’s plan of the khan was made by Dimitri Baramki, and it is preserved in the Archives of the Palestine Archaeological (Rockefeller) Museum in Jerusalem. 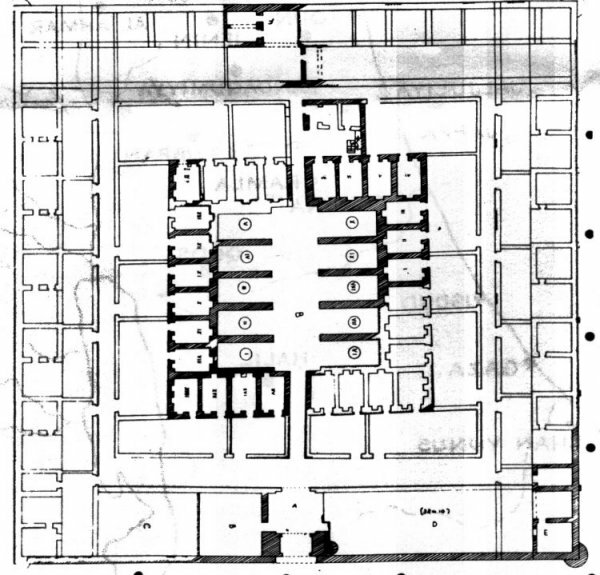 This plan shows the remains of the Khan existing at that time, and includes a reconstruction of the whole building. The sketch helps us to understand the Khan, especially the inner part which is full of new dwellings now, making it impossible to excavate. The Khan was square in shape, each side being about 85.5 m in length. The corners were oriented to the four cardinal points, and protected by round corner towers. The reminder of the south-west tower is sill in existence. The Khan had two floors: the lower one for the storage of goods and stables for animals, the upper one for the guests, rooms with the divan and the Mosque. The plan of this Khan is different in two respects from the general type of Khans. These differences were noted by R. W. Hamilton when he visited Khan Yunis in 1943. First, instead of having an open courtyard it is built around a block of inner buildings which are divided by an axial lane, in the manner of a suq or market; second, the rooms appear to be grouped in units consisting of two chambers and a small courtyard. 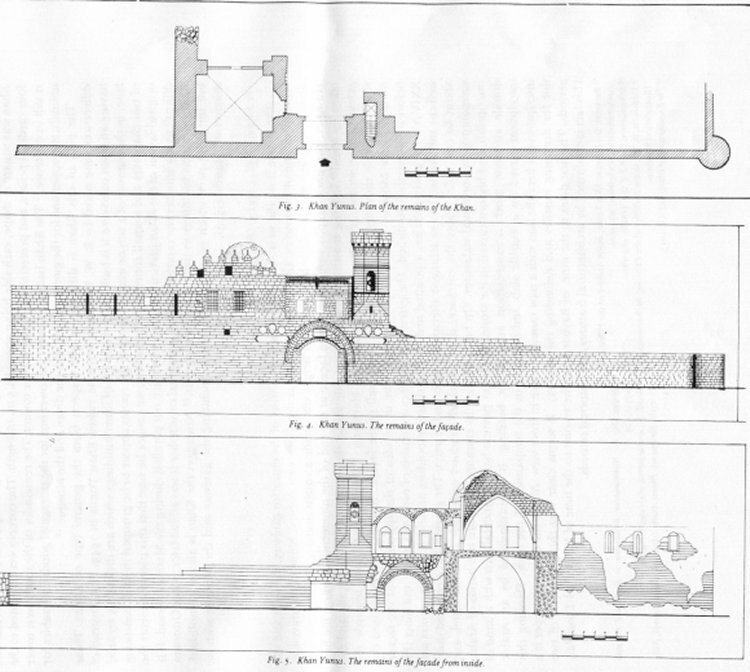 However, we cannot be sure that this plan represents the original layout of the Khan particularly since there are not parallels during the Mamluk period. It is difficult to say whether the central building in their central courtyard. 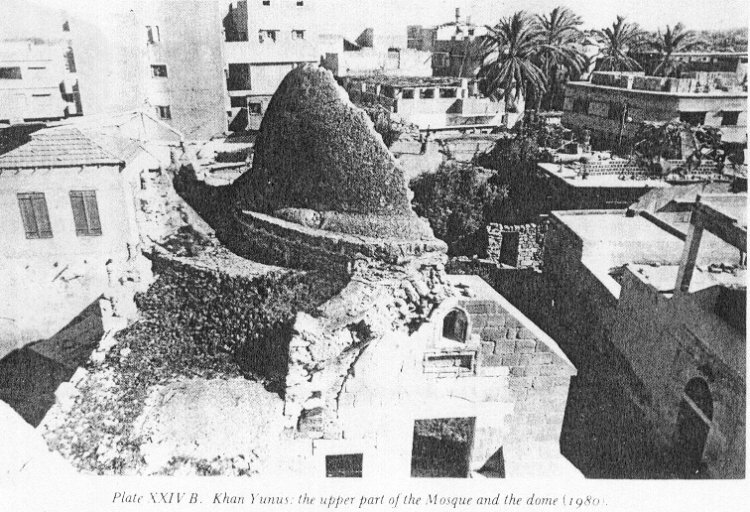 Nowadays the Khan is almost demolished, but the front part, which consists of the façade including the gate way and the Mosque with its minaret still stands. The façade is on the west side of the Khan. It consists of the entrance gateway, the walls and the remains of one of the towers. This tower is located at the south-west corner. None of the travelers drew a complete section of the façade, except Briggs who made a rough drawing of the gateway. However two photographs were taken of the façade at the end of the nineteenth century: the first taken by Musil looking towards the north west-west side shows the south part of the façade and the gateway. The second photograph was taken by Hermann Thierch and looks towards the south-west side showing the tower and the north wall of the façade and the minaret of the Mosque. These two photographs give us an idea of the appearance of the façade before it was partly demolished. The gateway of the façade consists of two parts, outer and inner (PIXXIV A). The outer part has a pointed arch with a simple moulding around it. The voussoirs are well cut and dressed blocks arranged alternately singly and pairs. The gateway has a recessed door about 60cm. wide. Above the entrance, there are three windows each with a marble lintel, and surmounted by horizontal stalactites. 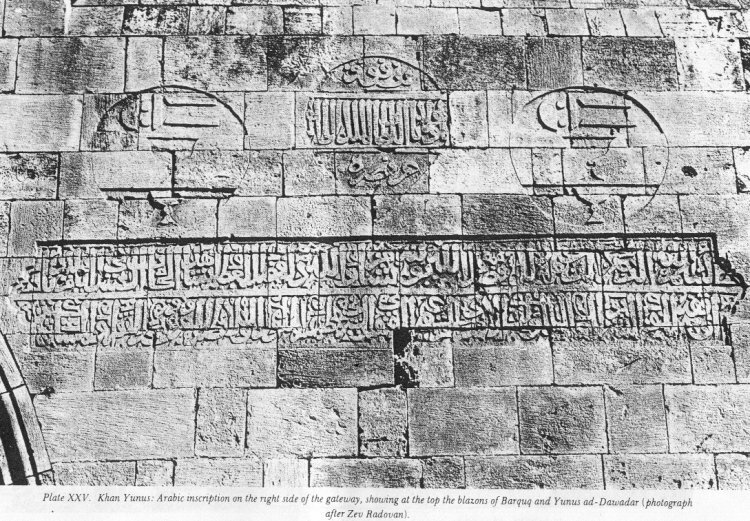 On both sides of the entrance, there are two bands of Arabic inscription, and blazons carved in the stones. The inner portion has a segmental arch with a band of double alternate tooth ornamentation around the heading. It is surmounted by an Arabic inscription craved on a marble slab and inserted in the tympanum of the arch. Flanking this inscription is a heraldic lion with a paw raised and face in front view. Above the entrance proper is a slot for dropping missiles and defending the gateway. It seems clear that the gateway is of two periods. The first dates to the time of Baybars and the second to the time of Yunis ad-Dawadar. This fact is confirmed by architectural features and historical records. The first architectural feature is the arch of the inner gate which is different from the pointed arch of the façade of the outer gateway suggesting that the façade arch has been added to an earlier gateway .Another feature is the stonework blazons on the curtain wall, and the lions in the inner gateway, which suggests two periods of stone cutting: blazons are intaglio while the lions are in relief: the lions are Baybras’ Symbol. The historical sources record that Baybars built many sabils (fountains) and lodging places along the highway between Cairo and Damascus, to facilitate his barid (post). Al-Umari who described and located the post-stations along the routes, mentions that as Silqa was one of these post-stations in Baybars’ time. Another historian, Ibn al-Furat, recorded that Yunis ad-Dawadar built his great Khan in a place called as-Silfa before Gaza. This village was named Khan Yunis after Yunis ad-Dawadar ‘s Khan. 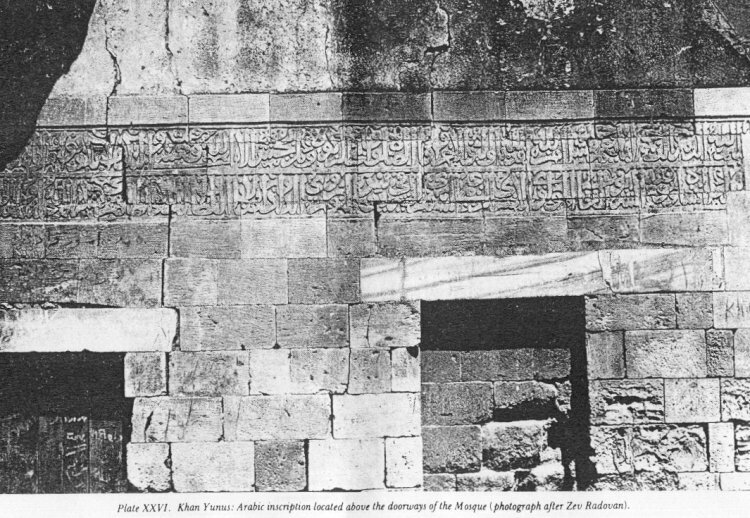 Perhaps he rebuilt it at the same place as Khan al-Sabil, mentioned in the inscription above the gate, which was built by Baybars. Three types of masonry are distinguishable on the façade, the first type is roughly cut like the masonry of the curtain wall. The second type is regular in shape (for example, the masonry of the south-west corner bastion). The third is well cut, beautifully squared and dressed, like the masonry around the gateway. A battlement was constructed on the top of the walls of the Khan, part of it at the top of the façade wall close to the cupola is still extant. It is also possible that it was used for defense purposes. The Mosque is one of the main parts of the Khan.. It is located on the left of the gateway, and comprises two floors. The first floor is a square room measuring 10 m. in length and 8 m. in wideth, with vaulting constructed of small roughly shaped blocks of stone, well mortared. It has two doorways, each has a marble lintel, and a large inscription carved in the masonry between the doorways. The second floor is almost entirely demolished. It had a domed roof carried on a drum. The east and the north walls are completely demolished and approximately half of the cupola from the eastern side has fallen down. The height of the cupola, which spans a room 5,20 m square, is 7,50 m. It is said that at the east end there was “a neat pulpit of pure white marble and Moresque, work with marble stairs leading up to it” The west side of the Mosque has many windows, each one with a marble lintel. The south wall is well preserved with a gate of well dressed stone, which is surmounted by a small rectangular and pointed window. 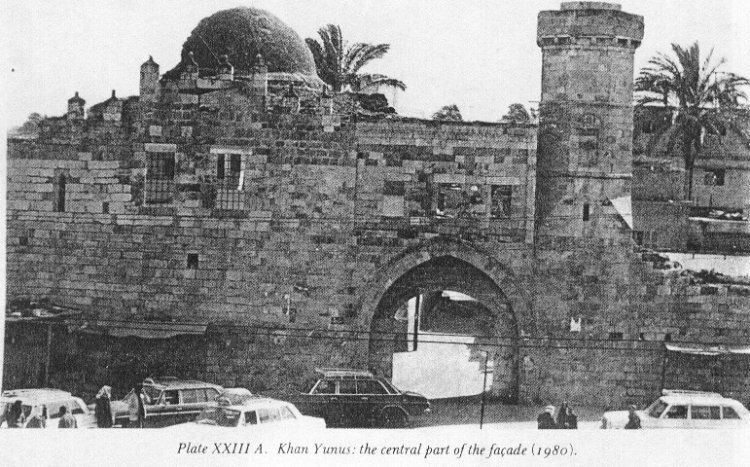 It was probably used as the gate of the second floor, because we did not see any other entrance for the second floor Mosque, neither from the lower floor, nor from any other side of the walls, except this one, although presumably the wall staircase ran from the eastern gate of the Minaret, over the vault of the entire gateway to the entrance of the Mosque. The minaret of the Mosque is on the right gateway with a stairway leading to it. It is at the level of the battlement. It is on a square base, above which is the principal part of the minaret. It is a massive octagon above the platform, divided into two parts, one smaller than the other. On the middle part of the minaret, there are many architectural decorations, four of the eight sides having shallow recesses resembling dummy windows; two of these recesses have shell heads, and the two others are placed at a slightly higher level, smaller in size with round heads ornamented with gadroons. Above them is a billet band going around the minaret. The other sides of the minaret are decorated with circles within which are written the words Allah (God) and Mohammed (The prophet). The round top of the minaret was demolished by the Turks during the First World War, when the British Navy used it as a guide for shelling the city. This minaret with its octagonal shape, seems to be more influenced by the Egyptian style than the Syrian. The wall of the Khan are decorated with almost five inscribed panels of carved stone. 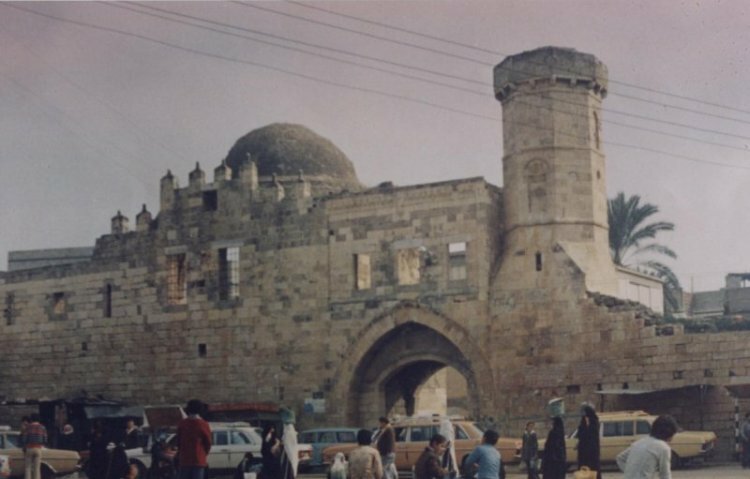 One of them is on the right side of the gateway, on the top if the entrance to the minaret and has been almost demolished. Some of the gateway and some other stones were lost, two of the other four panels are on the walls of the façade and they compliment each other. They give the name of the Sultan during whose reign the Khan was built by his Dawadar. (2) ومولانا السلطان الملك الظاهر سيف الدنيا والدين ابي سعيد برقوق خلد الله سلطانه وشد بالصالحات أركانه. (1 In the name of the most merciful God. This is the free grace of God, he bestoweth it on whom he pleaseth and God is endued with great beneficence. The fourth inspection is at the top of the gateway in the tympanum. It is a rectangular marble plaque, consisting of five lines, the fifth line indicating the date of the Khan. (1) أقول والحق له نورق يقوم في النفس مقام الدليل أن له العرش سبحانه قد عضد الملك بأكفى كفيل. (2) فالملك الظاهر بحر الندى أبي سعيد ذي العطاء الجزيل فأصبحت مصر به جنه وأهلها في لهو ظل ظليل. (3) والهم الله داواداره يونس للخير وفضل جميل أنفق من ملجأه من ماله خانة الله بخان السبيل . (4) يبغي به الأجر وحسن الثناء عليه طول الدهر في كل جيل لا أمر الله بها دولة ولا حامية من بركات الجليل. (5) وتم الخان لتسع مضت بعد ثمانين بعون الجليل وسبع مئين لذا أرخوا وحسبنا اله ونعم الوكيل. (1 I chant the truth which has splendour and stands s a proof to the soul . That he, praise be to him, the possessor of the throne, has supported kingship a most capable protector. Al-Malik az-Zahir Abu Sa’id , the generous sea, possessor of plentiful bounty. Thus, Egypt has become, through him, a paradise, while its people enjoy their umbrageous shade. Allah has guided the Dawadar Yunis to good deeds. Though this guidance he offered his wealth to establish a caravanserai (Khan) in as-Sabil. ( All he aimed for was a reward from God and to be praised all the time by generations. May Allah offer him the blessings. With the help of the Almighty he completed this Khan in the year 789 A.H./A.D. 1387 as dated. God will suffice us as he is the most trustworthy. (2) انشأه ووقفه الشريف العالي المولوي الأميري الزعيمي السفيري الشرفي يونس الداوادار مولانا السلطن الملك الظاهري شكر الله عمله وأبلغه مأمله .